Japanese Sniper Rifles of the Second World War covers the various Japanese produced Sniper rifles used in the Pacific Theater of World War II. This subject has not been covered this deeply in any other publication. Get your today! Only a few hundred copies have been printed! For more information, contact the author Francis Allan. Wow! 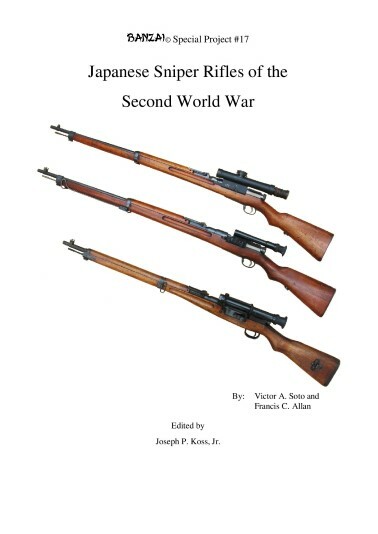 Once again, the Authors of Japanese Sniper Rifles of the Second World War have created another must have for the Collector of Japanese weapons...and the Second, better, more information, and visual tome on Siamese / Thai produced Rifles and Accessories. The color pictures & translations of markings are more than worth the nominal $55 'price of admission.' The cross reference of markings to English will be invaluable in translating those mystical markings on the weapons we encounter in our collecting endeavors. Known surviving examples, markings, & translations in published form allow for comparison, study, & reference for similarly marked weapons. Limited Printing, Buy an extra copy, I did! Buy yours NOW! The next greatest thing since sliced bread,	Milwaukee's Best Light Beer, Japanese Sniper Rifles of the Second World War and Japanese Imported Arms! Awwww - Shucks - We didn't get to take as many pictures this time!